This entry was posted in Food, Recipes on December 17, 2012 by admin. I blogged today on Cleveland.com. This entry was posted in Food, Recipes on December 12, 2012 by admin. 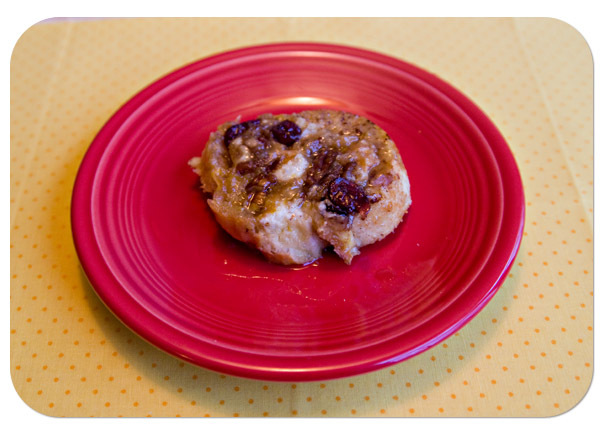 I’ve imported this post from my dusty ole cooking blog, How 2 Stay Fat. Not because I’ve necessarily given up on H2SF, but I’ve also not given up on my closets being organized, and I think you can imagine how well that is going. Plus, it’s the time of the year for this recipe. Also, I’m lazy. So… here ya go. A blast from the past, aka 2010. I’ve taken out some of the photos from the original post as I’ve realized that I was out of control. I also could have taken out 80% of the jibberish, but then it would have been a totally different post. Or something. STFU and eat. If you haven’t forgotten about me entirely, I bet you were saying “I wish that broad would post already.” Well I am here to answer the plea of no one with a brand new post. With a perfect holiday treat, no less. All hail the Festivus pole. 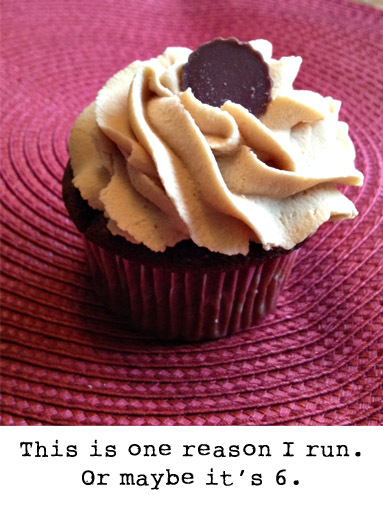 This recipe comes to us via my long-time friend inside the computer / long distance running buddy, Brenda. (That is to say, we run far apart. Not long distances.) I suspect she’s trying to fatten me up so that she can be faster than me. Sadly, it’s working. One thing I hate is Biscotti you can buy at the store/coffee shop that’s so hard you could kill a man if you hit him with it. This is not that Biscotti. Sure, it’s still got some crunch to it. But, it shouldn’t knock any teeth out, at least unless they were already loose to begin with. I love it for the holidays, especially since the pistachios are green and the cranberries are red. How quaint. The best part is, it looks like it was hard to make, but it totally isn’t! Don’t forget where you are – we don’t do complicated here. What to gather: Cranberries, Pistachios (shelled if you can find them / are lazy), flour, sugar, baking soda, salt (only if your nuts aren’t salted), eggs, vanilla extract, orange extract, extra light olive oil (more on this later). Now it’s later. Make sure you use “extra light” olive oil. Not to be confused with extra virgin. You do not want the taste of olive oil overpowering your biscotti, so trust me on this one. Extra Light Olive Oil. Do it. And then combine it with the sugar in a bowl. Tricky so far, I know. Then, we’re going to add our extracts! It originally called for vanilla and almond. But I was out of almond thought that orange would beautifully complement the cranberries, and I was right. So, from now on, vanilla and orange it is. In a separate bowl, combine your dry ingredients. Including the salt, if you are using salt. I didn’t, as my pistachios were pre-salted. If yours aren’t, make sure you add it! So, flour, baking soda, and salt (optional). Then, add the dry ingredients to the wet, and mix to combine. Now we need to add the nuts and cranberries. Before adding mine, I gave them a rough chop. Not chopped to smithereens or oblivion or anything. Just a couple wacks will do. Some will remain hole, some will get cut. It’s ok. Don’t get too wound up about it, really. It’s Christmas! This dough is sticky, so if you want to mix the nuts and cranberries in by hand, make sure you’ve already readied your pan already. Otherwise, you’re going to have messy hands and no where to turn. Except the sink of course, but you won’t feel like washing your hands right that second. Don’t ask me how I know this. You can mix this with the spoon if you’ve done your pushup(s) today. If I had a picture of the mixed dough, it would be here. Just imagine it. It’s quite beautiful. Then rub the other hand with the first hand. Now, using just that tiny bit of flour, you’ve floured your work surface, both hands, and make the universe smile. You might consider taking your rings off first. Don’t be like me. Now form your dough into 2 equal size logs. How wide/long you make your logs is up to you. I wanted smaller pieces of biscotti so that they could go on my cookie platter and not be 6″ longer than any of the other cookies. Wouldn’t want them to feel bad, you know. Sometimes size does matter. So, my logs are about 2″ wide. Once they’ve finished that first bake cycle, remove them from the oven and allow them to cool for 10 minutes or so. In the meantime, reduce the heat on the oven to 275­° and make some coffee or something. Or take the baby doll away from the dog. Or re-roll your parchment paper that a kid just sent spiraling down the stairs. Or, whatever it is you do during 10 minutes of cool down time. Once 10 minutes has passed, slice both logs, on the slight diagonal (It just took me 5 tries to spell diagonal. Apparently I should have used my 10 minutes to make coffee.) into slices around 3/4″ thick. Use a fairly decent knife so you aren’t obliterating it! This is one of the end pieces. Yummy looking, yes? Eat all 4 end pieces immediately. Line up the slices, on their sides, on a parchment lined baking sheet. Back into the oven they go, for another 10 minutes, or until they’re dried. Not much will change, appearance-wise, so make sure they aren’t on fire in there! No, they didn’t move during the second baking cycle, I shooshed them together for the purpose of this photo. I’m rebellious that way. Now, you could stop right here and be done. Cranberry Pistachio Biscotti, a perfect holiday treat. Or, you could get ridiculous. Guess which one I chose? Keep in mind, if you’re going to drizzle chocolate on yours, they need to be COMPLETELY cooled first. If you try to drizzle on warm biscotti, it will be a calamity of epic proportions. Or, just a mess. Either way, don’t do it. Have another cup of the coffee you made and wait patiently. Melt the white chocolate however you usually melt white chocolate. That’s another post for another day. Some people use a double boiler, I use my microwave. If you do the latter, just make sure you check it every few seconds. This is not a time to start the microwave and wander off. This can go ugly fast. I used about 1/3 of the bag, and it took just 90 seconds to melt. It was a little bit thicker than I wanted for what I was doing, so I added about a teaspoon of Crisco, which made it perfect. There are 1001 ways to drizzle chocolate. I prefer the crudest, most ghetto way possible. A sandwich baggie. Pour it in, zip it up, and cut a SMALL hole in the corner. Now, just zig zag back and forth across each piece. You gotta move fast, once you start that stuff pouring out, it doesn’t stop. Unfortunately, I don’t have any live action shots of me doing the drizzling, as while I do have mad drizzling skills, I do not have mad drizzling with one hand while taking photos with the other skills. So, imagine me, thin, gorgeous, perfectly dressed and made up, and drizzling like a pro. One half of 25% of one of those things will be how it actually happened. Preheat the oven to 300 degrees F (150 degrees C). In a large bowl, mix together oil and sugar until well blended. Mix in the vanilla and orange extracts, then beat in the eggs. Combine flour, salt, and baking powder; gradually stir into egg mixture. Mix in cranberries and nuts by hand. Divide dough in half. Form two logs (12x2 inches) on a cookie sheet that has been lined with parchment paper. Dough is sticky, lightly flour your work surface and hands, if necessary. Bake for 35 minutes in the preheated oven, or until logs are light brown. Remove from oven, and set aside to cool for 10 minutes. Reduce oven heat to 275 degrees. Cut logs on diagonal into ¾ inch thick slices. Lay on sides on parchment covered cookie sheet. Bake approximately 8 to 10 minutes, or until dry; cool completely. Drizzle with melted white chocolate, if desired. This entry was posted in Food, Recipes on December 10, 2012 by admin. This is my mostest bestest breakfast. I saw it on the Laughing Cow site. Where I was searching for recipes for Laughing Cow Lite Swiss cheese as I purchased it at Costco in a pack of about 42 million. Sounded weird, but I’m gullible, so I tried it. ERMAHGERD. Love. Which is exactly how I do it, minus dropping my iPhone into a pot of boiling water. So, there ya go. Make it. And be happy. But don’t be a traitor. Because while there are varying accounts of how Eggs Benedict got their name, none of them seem to involve Benedict Arnold. Toast english muffin. Spread with cheese. 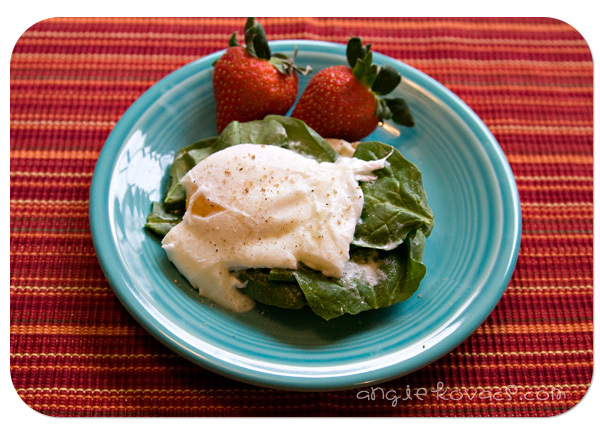 Top with spinach leaves, poached egg, and salt and pepper to taste. This entry was posted in Food, Recipes on November 21, 2012 by admin. It’s that time! Time to make the grocery list. Then spend $250 on one meal. Then try to figure out where to put all this food. Then swear I will scale it down next year. Here’s what’s on our menu, with links where possible. What are YOU having? Who does the cooking in your family? Cody (16) will be preparing our meal this year. Yay for me. I will help, of course. I’m a do-er. This entry was posted in Food, Recipes on November 19, 2012 by admin. Bundt cakes are so very underrated. I swear. I have a whole Pinterest board of them. They are easy to make, delicious, and if you have fancy pans (I do not), can even be fancy. Plus, I like using the word ‘fancy’. Also, I’m pretty sure they are just giant muffins, which means it counts as breakfast. This is my current favorite. Although, I wanna make a cranberry orange one – that could take over if it goes well. This is definitely sweet, so don’t get all crazy and try to put a glaze on it or anything. If you use frozen blueberries, they won’t sink to the bottom of the batter. Plus, you can buy the ingredients and then get too lazy to make it for days on end without losing your berries. Not that I’d ever do that. Preheat oven to 350°F. 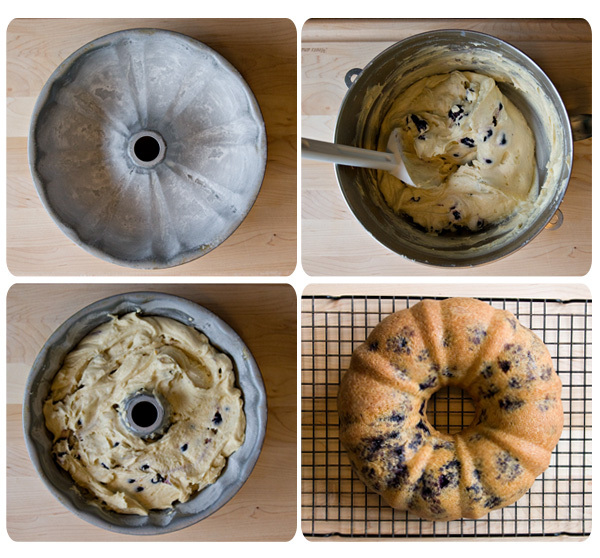 Butter and flour 10-inch-diameter Bundt pan. Whisk flour, baking powder, and salt in medium bowl. Using electric mixer, beat 1⅔ cups sugar and butter in large bowl until light and fluffy. Beat in eggs, 1 at a time. Beat in orange peel and vanilla. Beat in dry ingredients in 3 additions alternately with buttermilk in 2 additions. Fold in blueberries. Pour batter into prepared pan. Bake until tester inserted near center of cake comes out clean, about 1 hour. Cool cake in pan on rack 10 minutes. Turn cake out onto rack and cool completely. (Can be made 1 day ahead. Wrap in plastic and store at room temperature.) Transfer cake to plate, sift powdered sugar over, and serve. This entry was posted in Food, Recipes on November 14, 2012 by admin. Fall is here, and it’s soup season! I love all soups. Passionately. I also love black beans. 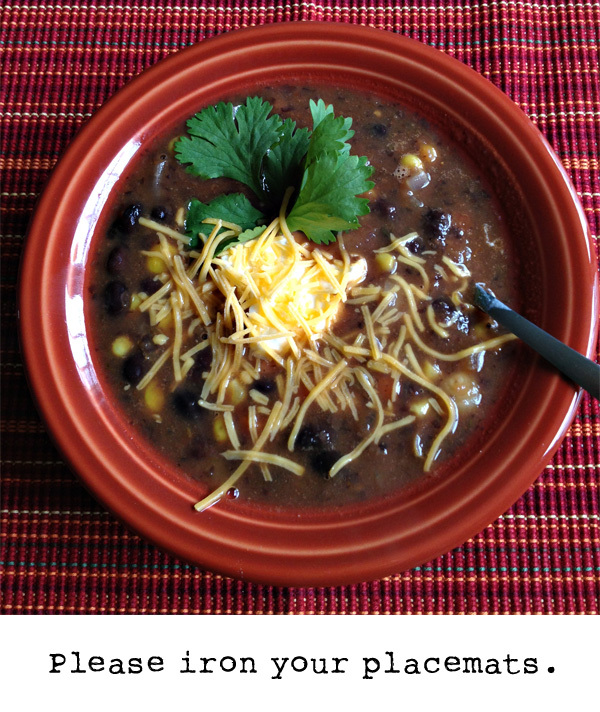 So, for lunch I whipped up this yummy black bean soup. Delicious! In a large sauce pan, heat oil over medium heat. Add onion, garlic and carrots, and cook until onion is softened. Add chili powder, cumin and pepper; cook another 1 minute. Add vegetable stock, half of the black beans, all of the corn, and bring to a boil. In food processor or blended, puree tomatoes and remaining beans; add to pan. Reduce heat to low, cover, and simmer 10-15 minutes until carrots are tender. Top with chopped cilantro, sour cream, and shredded cheddar or Monterrey jack cheese. 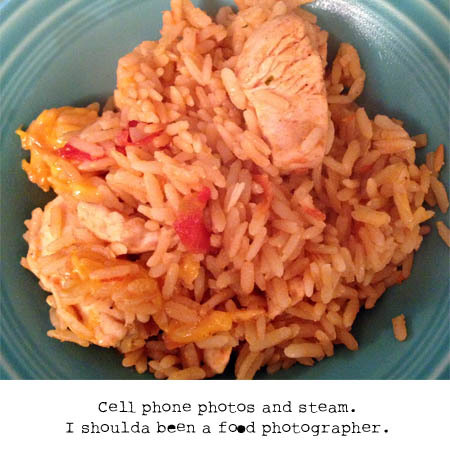 This entry was posted in Food, Recipes on October 31, 2012 by admin. Don’t get too excited. One of the pressure of trying to keep up my dusty ole food blog was to always have some exciting meal I’d made to post about. 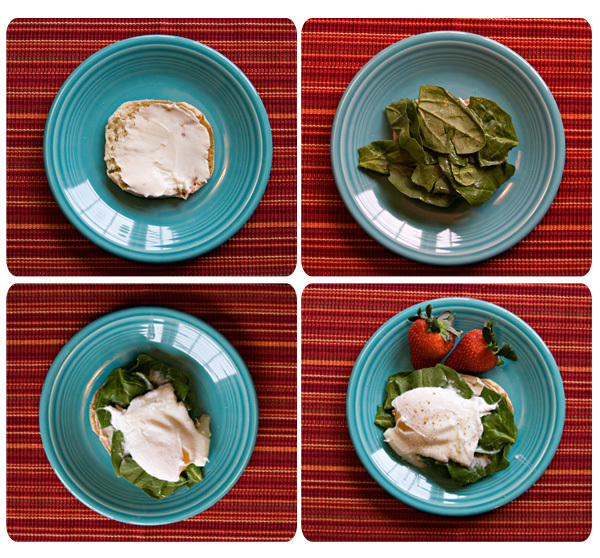 The fact of the matter is, sometimes we eat like this. Easy one pot meals that are kid friendly. So, I thought I’d share it with you, as unexciting as it may be. If not for the kids, I’d add black beans and corn. And heaven knows what else. I did give them flour tortillas to go with it, which makes me extra popular. Heat olive oil in a large skillet over medium-high heat. Season chicken with taco seasoning, salt and pepper. Cook and stir chicken in hot oil until cooked through and juices run clear, 5 to 7 minutes. Add the broth and salsa and bring to a boil; turn off the heat and stir in the instant rice. Sprinkle Cheddar cheese over the mixture. Cover the skillet and let sit until the rice is tender, about 5 minutes*. *I actually brought the mixture to a boil, added the race, reduced to low and cooked for 10 minutes covered. For Cincinnati we had Carrot with Cream Cheese Frosting. For Columbus, I made Reese’s. Almost worth running 26.2 miles for. But you can have them just because! Cupcakes: Stir together flour, cocoa, baking soda and salt. In a separate bowl, combine water and buttermilk. In large bowl of mixer, combine sugar, brown sugar and butter. Beat until light and fluffy. Add egg and vanilla. Add flour mixture, alternating with water mixture. 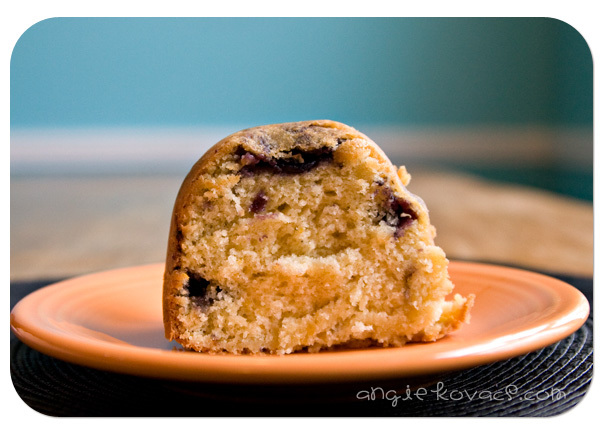 Scoop into 12 paper lined muffin tins. Bake 18 minutes at 350­°. Allow to fully cool. Frosting: Cream butter and Peanut Butter until fluffy. Gradually add powdered sugar, alternating with a little milk at a time. Beat well, until desired consistency. Frost cupcakes. Resist temptation to just eat all of this frosting. 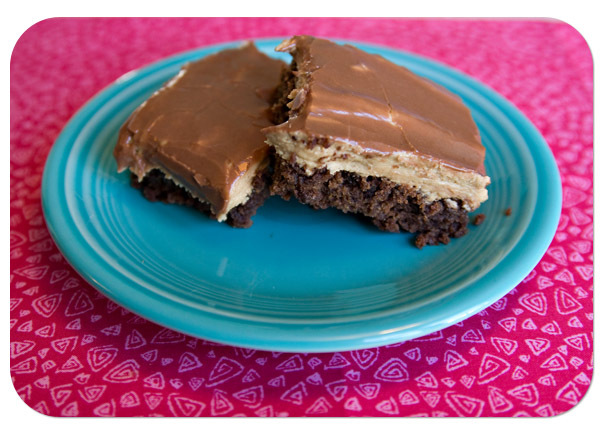 Top with Reese's mini peanut butter cups. This entry was posted in Food, Recipes on October 19, 2012 by admin. I try to eat right. I really do. Damn difficult, that. One thing I’ve been focusing on lately is breakfast. I’m more of “ignore eating until my stomach turns inside out and I realize it’s 1:30pm” type. But, I’ve been making an effort. Here’s what I had today. Cook the oats according to package directions. When the oats are almost done, stir in the pumpkin puree and spice . Allow to finish cooking (to heat pumpkin through). Put in a bowl, and top with maple syrup, nuts, and Craisins. (Or whatever you choose!) 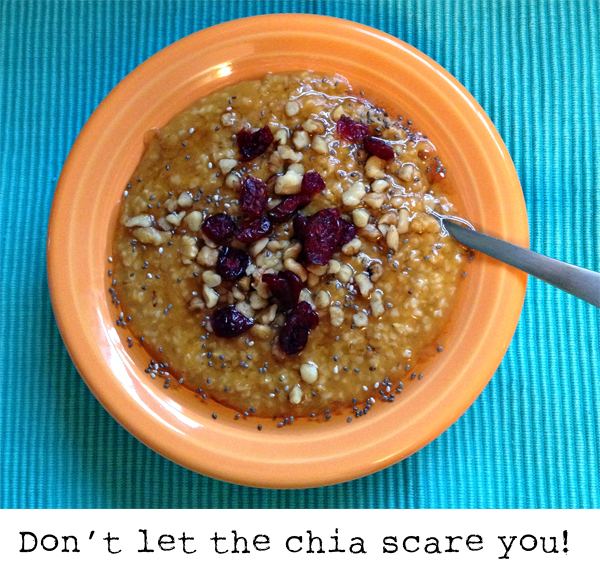 I added 1 tsp Chia seeds to mine. You can have fun with this. Add flax seed or Chia seed if you have them. Use regular oats instead of steel cut. Add a splash of Almond or Soy milk. Go nuts. Use honey or cinnamon sugar instead of maple syrup (I like to add something sweet, since the pumpkin isn’t). And eat breakfast! This entry was posted in Food, Recipes on October 15, 2012 by admin.